Mascus www.mascus.ie, one of the biggest online marketplaces in the world for the sale of transportation vehicles, construction machinery, agricultural, material-handling equipment and forestry, is taking you under the hood of your excavator, tractor, crane or other heavy machinery with its latest service, Mascus specs - a technical guide for machine specifications. “Mascus Specs is specifically designed to make finding the right piece of equipment even easier for our customers, no matter where in the world they are,” explains Managing Director Rickard Krøtø. “A key part of this new function is that we’ve also made it multi-lingual so that customers across the globe can use the feature, not just those in English-speaking countries,” he adds. Mascus Specs is a new service that’s available to both buyers and sellers using the Mascus platform. It provides an instantly accessible database of technical information on a huge range of machinery. The database, which is accessible in any language, contains specifications including diagrams, technical details and pictures. 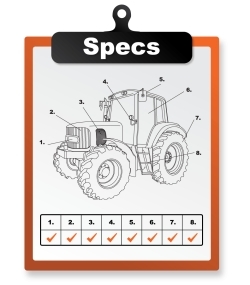 From data sheets to manufacturer’s manuals, the purpose of Mascus Specs is to make it easier for customers to locate exactly what they need quickly and easily. The Specs section will be sub-categorized into easy-to-navigate categories. For sellers, it gives them the opportunity to make their machinery more attractive by providing potential customers with vital information to help them make an informed choice. The system has been developed with Mascus’ partner Lectura Verlag from Germany, a publishing and consulting company specializing in data servicing, market research and machinery valuation. “The input of Lectura has been absolutely invaluable in producing the final system,” explains Mascus’ Managing Director Rickard Krøtø. “A year’s worth of collaboration with Lectura has meant that we have been able to integrate Lectura´s concept and technical database containing information on nearly 100,000 machinery models, covering everything from construction, material handling, lifting and access, as well as recycling, municipal and agricultural equipment. This database is also organic, so as more machinery comes online we’ll be able to add that information, giving our customers the best possible service,” he adds. Mascus have seen a highly successful year take them to the top of the rankings, including becoming world leaders in online forestry equipment sales. They have been constantly improving their presence across the world and now have: more than 3.5million visitors every month, with 5,500 companies advertising from around the world via more than 240,000 online ads. Their presence extends into 42 countries worldwide that covers 54 Mascus domains in 39 languages. The new Specs feature is part of their ongoing commitment to deliver a high quality service to both buyers and sellers of machinery across the globe. “Anything that makes it easier for our customers to find exactly what they want quickly and easily is going to make the Mascus experience a better one, as well as driving the industry forward into new areas,” says Rickard Krøtø. “This is an exciting and very positive way to draw what has been one of our most successful years to a close, as well as setting the stage for a very busy 2013,” he concludes. Mascus - Is an online marketplace for farm machinery, forestry, material handling and groundscare equipment, construction and transportation vehicles. Product ranges include tractors for sale, trailers for sale, used trucks for sale, diggers, box trailers, mini diggers and excavators. Mascus makes trading in used machinery and equipment quicker and more efficient by collecting in one place information about the supply and the demand. All dealers, producers, and end users are welcome to offer their used machines and equipment for sale via the marketplace. Lectura Verlag - is a German publishing and consulting company specialized in data service, market research and machinery valuation. Lectura´s database offers technical data and valuation for almost 100.000 machinery models covering construction, material handling, lifting and access as well as recycling, municipal and agricultural equipment. Valuation services are available through printed Lectura Guides and Online. The online version offers a wide range of solutions - single valuation, yearly subscriptions and individual company licenses. Lectura Data Services give daily support to dealers, manufacturers, insurance, bank, leasing and customs officers.